I figured out the secret to making networking EASY, so of course I'm sharing my new discovery with you! I'm sure, like me, your December calendar is full of Christmas get togethers, work parties, Santa socials, tacky sweater shindigs, and singing carols with your crew. I'm sure, also like me, that you're excited about meeting all sorts of new friends at these festive gatherings...or are you?? I know small talk at parties and especially "networking" with the intent to form a new connection that could potential benefit both of you in the future is tough! For some people, it might come naturally, or they've just had so much practice, that they float around a party and work the room faster than Santa's elves can say "Rudolph;" meanwhile, you're in the corner snacking on Christmas Crack, talking to the one person you know...who you also carpooled with. What do you talk about? How many times can you ask "soooo how do you the the party host?" and most importantly, how do you just walk up to someone and start talking! Well, you don't! It's simple, you make THEM walk up to YOU! That's right, let them do the hard work of coming to you! I bought two of these tumblers and whenever I go to a party, I carry one and I ask my friend to carry the other. When we walk into a room together, people are immediately curious about the disco balls- what are they, why are we carrying them, and how do they get one?! I walked into a coffee shop with one and the barista asked me about it right away; same thing at a restaurant for dinner. I realized that having a "prop" was giving people a chance to start a conversation with me and I had something to say to them in return. Obviously, this is great for event promotion, but it's also eye opening for real life interactions beyond the holidays as well. 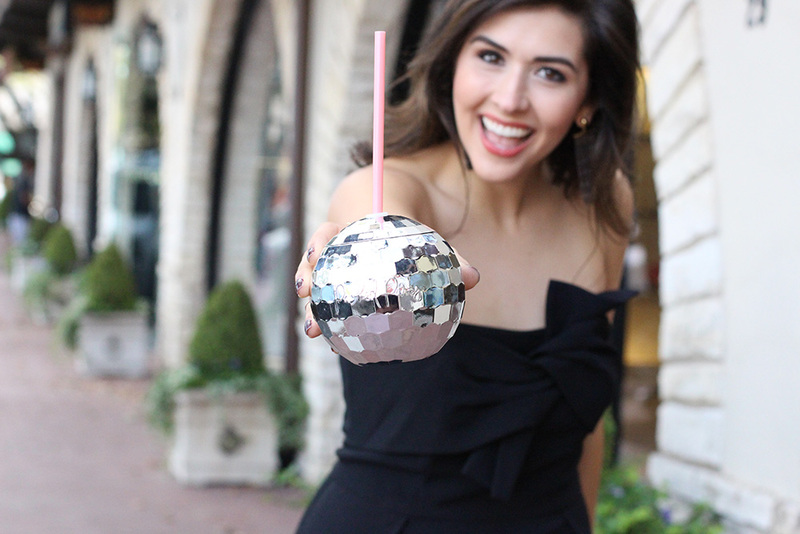 I've realized that before carrying my disco ball tumbler, I probably looked pretty "closed" or unavailable for a conversation or even a smile! It's sad to think about, but now that I'm aware of what could happen (so many new friends and counting! ), I'm always looking for the next opportunity to talk to someone- it's a simple shift in my expectation for my coffee shop run, party hopping experience, or even my pilates class. Now, I'm anticipating people talking to me and I'm looking forward to enjoying a nice conversation with them. SO to be honest, this isn't just a holiday networking secret; the holidays are probably the easiest time to become aware of this and wear or carry something more outrageous than normal, so take advantage of the few weeks left and start training your brain to be open to new connections everyday!